During the first week after her stroke, this sweet coyote's future was uncertain. Jackie seemed frustrated with her own body, and would growl and bite at her legs when they refused to work. Her struggle was hard to watch, but at the same time gave us hope that if there was any way to recover from this event, this determined little coyote might be able to do it. Jackie's fierce determination to overcome challenges is an inspiration to all of us, and a reminder of the resilient spirit in wild animals. 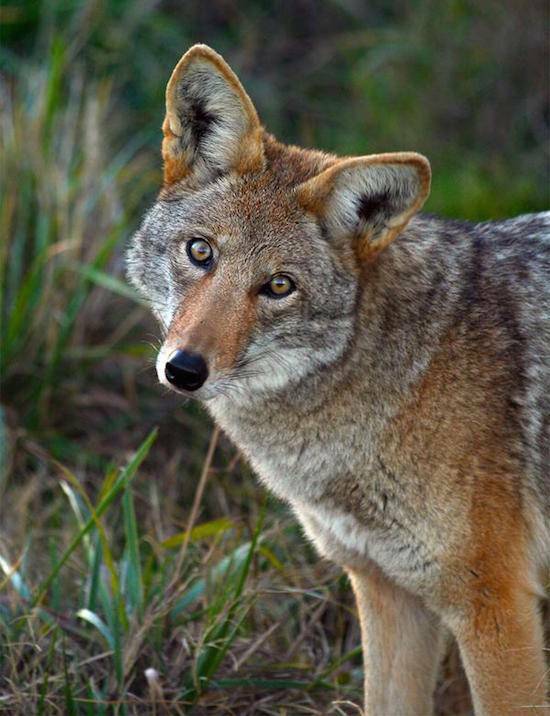 During the late morning hours of November 7, 2015, Galt sanctuary keepers noticed Jackie the coyote dragging one of her hind legs and immediately called PAWS' veterinarian Dr. Jackie Gai. Earlier that morning Jackie had appeared normal, actively trotting around her grassy habitat after breakfast exploring for birds, bugs and new smells. But now her condition began to rapidly decline and soon she was completely unable to stand up or walk. Dr. Gai and veterinary technician Lynn Dowling arrived quickly and performed a physical examination in hopes of finding clues about Jackie's sudden and dramatic disability. X-rays did not show any fractures or dislocations, and a thorough examination offered no explanation for her sudden mobility problem. Galt sanctuary supervisor Larry and keeper Seth assembled a smaller kennel-type enclosure within the coyote's large enclosure so veterinary and keeper staff could watch her closely. The temporary kennel was erected near her den where she felt most safe, and her den was bedded down with a thick layer of hay for extra comfort. Soon after she awoke from her exam, it was obvious that Jackie had significant problems. She was unable to get up from a prone position, and the entire left side of her body was weak. The left side of her face drooped, and even her facial expression and personality had changed. PAWS veterinarians suspected a brain abnormality. A video of Jackie was sent to a board-certified veterinary neurologist who agreed that Jackie had probably suffered a vascular event in her brain - what is commonly referred to in human medicine as a "stroke." During the first week after her stroke, this sweet coyote's future was uncertain. Jackie seemed frustrated with her own body, and would growl and bite at her legs when they refused to work. Her struggle was hard to watch, but at the same time gave us hope that if there was any way to recover from this event, this determined little coyote might be able to do it. Reluctant to move, Jackie preferred to rest in her den where keepers would place food and water within her reach. Coyotes are notoriously observant and wary, and it took some creativity to hide her medications in her food so she wouldn't refuse to take them or spit them out. Over the next several days and weeks Dr. Gai spent time sitting with Jackie in her little enclosure, watching closely for signs of improvement. During these visits Jackie would struggle to sit up and stand and would lean against Dr. Gai for support. These visits became a form of much needed physical therapy, as Jackie was both stimulated to move, and physically supported while she re-learned how to stand and walk. Soon, we began to notice very subtle, tiny improvements. Her face droop gradually went away, and she was slowly learning how to lift and place her paws without dragging them. Within a short period of time she was standing on her own, even walking short distances without support. Our hearts soared with hope! Larry, Seth, and the other keepers worked diligently to get Jackie's entire habitat ready to accommodate her disability. They filled in any of the holes she had dug with soil and sand, creating a smooth and even surface that would be easy for her to navigate. They also thinned out some of the bushes and grasses, leaving her favorite hiding spots but also creating clear areas for her to walk without obstruction. Exactly one month after her stroke, Jackie was released from her small enclosure back into her large habitat. We were thrilled to see her explore her new digs, moving with a slight limp but a confident trot nonetheless. Today, a little more than three months after her stroke, Jackie is back to her active, busy lifestyle. Except for a slight limp that comes and goes, she is moving well and seems to really enjoy her newly "remodeled" habitat. At 14 years old, Jackie is considered elderly - as are many of the animals who call PAWS sanctuaries home. Our goals are to provide animals with expert and compassionate care, to support them nutritionally and medically, and to provide an environment where they have the freedom to choose how to spend their days, and where they are free to express natural behaviors. Jackie's fierce determination to overcome challenges is an inspiration to all of us, and a reminder of the resilient spirit in wild animals. To donate towards Jackie's care, visit the Performing Animal Welfare Society (PAWS) website.